There are so many reasons a child may be shy in the early days of a new class or surrounding. The wonderfully inclusive idea below may help ease the anxiety of being in a new surrounding with new faces. 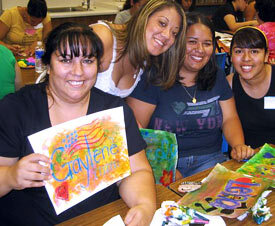 The staff from Stone Soup Afterschool Program in Los Angeles learned new painting techniques as they geared up for a new school year this week. Try this "Name Doodle" idea as a warm-up introduction during the first few days of your program. Using plain white construction paper, each person draws their name in block letters and doodles symbols about themselves onto the remaining paper. 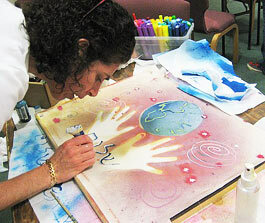 Cover your entire paper with Colorations® Foam Paint and wipe off the excess paint with a clean paper towel. Easy, colorful and it's dry right away!